Today is kind of a two-for-one day. It's really two flowers stacked together, and I liked the juxtaposition of materials together and created these little pretties. Let me make a HUGE disclaimer first. I've been doing it since high school and it's still really not my thing. It's because you have to count. I really can't keep numbers in my head and it's too monotonous for me. My mind wanders too much. You don't even want to know how badly I've messed up cross stitching. I've come to realize certain crafts are not my "thing". Ch. 3, sl st to make a ring. Rnd 1: Ch. 2, 9 dc into ring, sl st to 2nd st of the ch. 2. 10 sts. repeat ** 4 more times. Sl st and fasten off. 5 petals. It's a pretty basic one. One I still managed to foul up on a couple of stitches, but they still look like flowers. Good enough, moving on. If you don't crochet, then just skip along to the next step. Cut out two circles for your yo-yo's. Again I used my sizzix machine, but these are about 4 inches across give or take. Your finished yo-yo will be about half the size of the circle. Go to your sewing machine and adjust the stitch length to be on the longest stitch (or highest number) for a loose stitch that you can gather. Mine is 5. 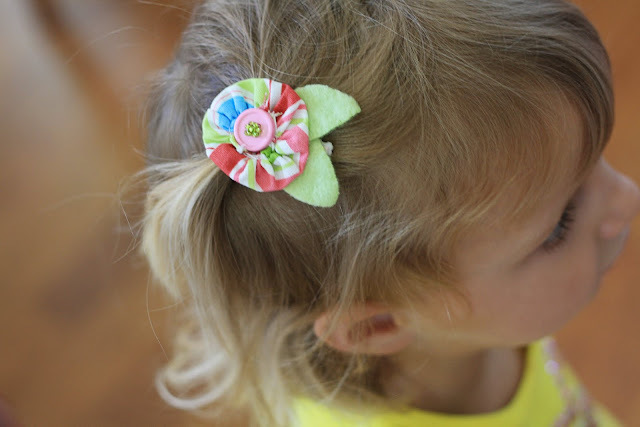 Sew around the edge of the circle with the right side of the fabric down and wrong side up. I use the edge of the foot as my guide. Sew all the way around and take it off the machine. Taking the bottom two threads, start pulling and gathering your circle. Keep pulling until you get a pouch. Seperate the bottom two threads from the top two. Make a simple knot tying the bottom threads with the top threads and pull tight. I do two knots to ensure my pouch will not come loose. Then snip off the excess thread. Flatten the pouch and pull out the edges to make a yo-yo. Stack them up! You can choose which side up for the look you want. When the opening is up, you see the gathers. When it is down, it's a smooth circle. This time I'm putting the opening up. (Sidenote: Sometimes I make differing sizes of yo-yos and stack them up instead). I picked out some buttons and decided I liked the big ones. You know, go big or go home, right? 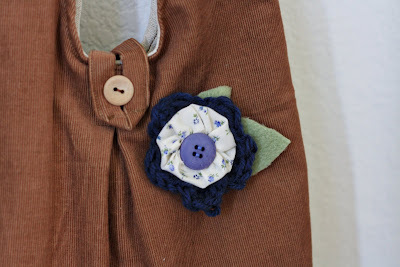 I sewed on the buttons and cut out some leaves from fleece, though felt works for leaves too. Then I hot glued the leaves to the back making sure all layers were secure. I put a pin on the back and attached it to a purse I made a while ago. And here are a couple more ideas from other projects I have done. 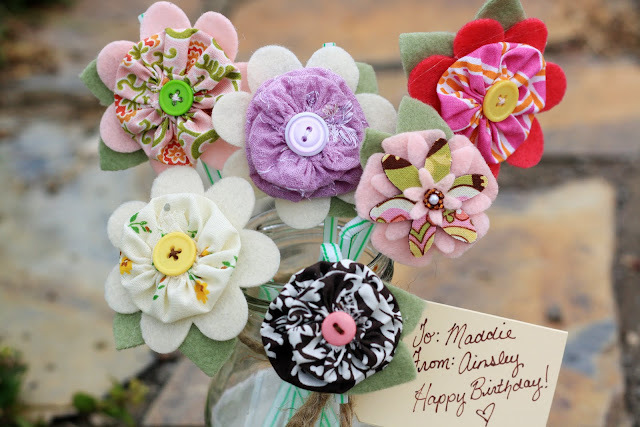 I posted this flower bouquet one here, but it's a set of hair clips for a little girl's birthday. On the brown and purple, I stacked up two yo-yo's in differing sizes. For the rest I stacked yo-yo's on felt flowers cut on my sizzix machine. This is one I sell in the shop. The yo-yo's are flipped over for a smoother look. I guess I just shared a trade secret. Ya'll must be mighty special. Just don't copy it exactly and try to sell it, Okay? Have fun with these yo-yo's! The possibilities are endless! 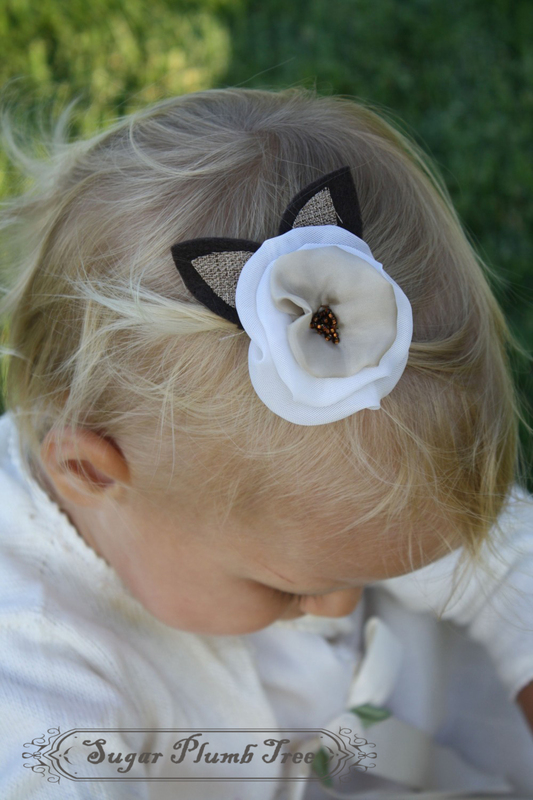 Oh goody, there are so many cute little things to make for girls!